I recently ventured to Portugal on a work trip. It was the first time I had revisited the country since a child, and my memories were limited to the acrid smell of drying sardines, long sunbaked road trips and my mother having her bottom pinched. This time my travels in João Rodrigues Cabrilho’s country of origin took me through densely planted eucalyptus and umbrella pine forests towards an overnight stop near the village of Santa Cruz. No doubt named a long time before the Californian coastline town, the heat and the flora were remarkably similar. Even the ocean, which I had been desperate to escape into after a hot dusty drive, was shrouded in the fog which often hugs its Pacific counterpart. The next day the similarities to the sunshine state continued. Comporta, on the edge of ‘Portugals best secret beach spot’, resembled a deserted Mexican style Hollywood stage set, complete with storks, nesting high on telephone poles and church bell towers. 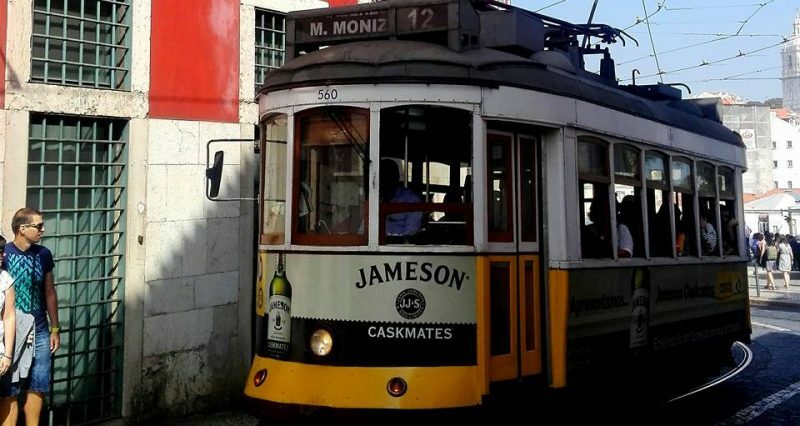 To enter the bustling metropolis of Lisbon, I was transported over the water on a slightly flimsier version of the sunshine state’s jewel in the crown, the golden gate bridge, only to be faced with a swarm of brightly coloured vintage trams as I negotiated a pathway through the narrow streets to meet friends for lunch. Thankfully, my new memories of the country are of the coastline which so resembles one of my favourite destinations in America, the overwhelming beauty of the tile-clad buildings and the refreshing taste of Vino Verde.